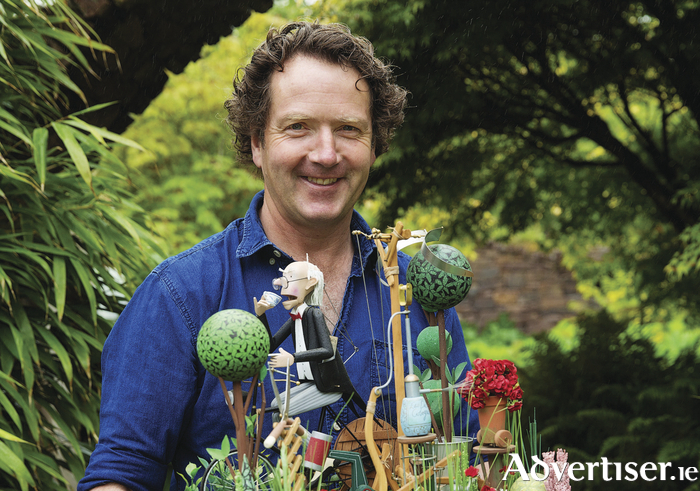 Celebrity garden designer Diarmuid Gavin will be bringing his green-fingered wit and wisdom to Galway next month for a one-man show at the Town Hall Theatre where he will explore the world of gardening, with stories of the Chelsea Flower Show, where he has exhibited nine times, winning the Gold Medal in 2011 for his Irish Sky Garden. Ahead of his trip west, Gavin shot the breeze with me over an amiable half hour or so, beginning with his recollection of how he was first drawn to gardening; “As a kid I always liked the outdoors; I liked the freedom of being outside. We lived near Bushy Park in Rathfarnham which had woodland and a lake, it was the ancestral home of George Bernard Shaw’s family. Gavin studied at the College of Amenity Horticulture in Glasnevin but, perhaps presciently, he cites as one of his key formative influences a TV gardener; “I used to watch the children’s programme, Blue Peter, on BBC and they had a gardener on called Percy Thrower. He was old-fashioned but when I saw him create the first Blue Peter garden I was utterly fascinated. He created a classic Italianate garden. In his twenties, Gavin won a number of awards at the RDS gardening competition but his appetite for innovative contemporary designs found few patrons in 1980s Dublin. He endured lean times, even having to ‘crash’ on friends’ sofas for a period. While he now enjoys fame and success did the experience of those hard years shape his world view? One early Dublin patron and encourager of Gavin’s work was socialite Terry Keane. Gavin’s friendship with the family further blossomed when he married Keane’s daughter Justine and the couple now have a 12 year old daughter Eppie (she has “absolutely no interest in gardening,” dad notes ). In 1995, Gavin entered a garden to the famous Chelsea Flower Show for the first time and won a Bronze Medal. His success at Chelsea, then and in following years, led to his commercial breakthrough, but he has also often ruffled feathers there. “I’m coming along with different ideas that challenge the traditional ways of doing things,” he states. “I come along saying I’m not here to win medals, I don’t care about that; I want to try different ideas and they don’t know how to deal with that. Because I don’t really care about what they say but just want to try something to see how gardeners and the public react to it, then if you add the amount of attention I get when I do a garden at Chelsea compared to others, that really ruffles feathers, but I never go out looking for that. Diarmuid Gavin comes to the Town Hall Theatre on Friday June 9 at 8pm. Tickets are €20 from 091 - 569777 or www.tht.ie Gavin is also is reinstalling his 2016 Chelsea entry The Garden of Pure Imagination in Dundrum Town Centre where it will be open to the public from May 20.